As women we go through life stages and changes that affect us outwardly and inwardly. 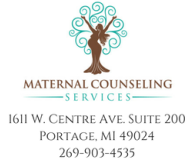 At Maternal Counseling Services we help you understand and make sense of the internal changes that cause anxiety, depression, sadness, fear, worry or turmoil. What are these changes? Attempting to find out who you are as a woman, how you fit into the world. attempting to tackle the fear and anxiety of "doing it right or perfect," as you transition in your career, your relationship, into parenthood or any life stage. Experiencing grief from loss - loss of a loved one, loss of your ideal future, loss of friendship or loss of yourself, your identify, who you are in the world. In life we experience quite a bit that can make us feel broken, discarded, alone and isolated. At Maternal Counseling Services we believe that you have an intrinsic beauty, wholeness and greatness that may just be hidden. We help you see that internal strength to build up, empower and restore those areas that make you feel weak. How do we do this? We help change the way you think. The technical term is through Cognitive Behavioral Therapy. We also incorporate Guided Therapeutic Imagery, which is helping you see yourself, your situation and your future differently. You can schedule an appointment online or you may call 269.903.4535 to schedule a 15 consultation call.